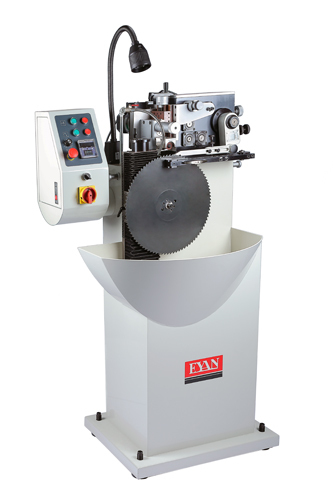 Automatic Circular Saw Blade Chip Break Machine for HSS circular saw blades. Grinding HSS and TCT saw blade. Patent vertical grinding method allows you to operate easily. Feed controller for stepless adjustment of working speed allows for variable grinding speed from 15-50 teeth/min. Driven by machinery instead of compressed air, make the machine stable and lower the failure rate. High-frequency electric spindle with rotation speed 50000 rpm which effectively extend the life time of grinding wheel. Quick clamp saw blade device using magnetic force to stable the blade. Equipped with counter, the machine will automatically stop when the operation is complete. ※All designs,spec. and characteristics shown as above is subject to any change withoul further notice.